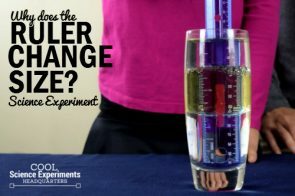 Here’s another super simple experiment that almost seems magical, but it works because of air pressure. Even though most of the time you can’t see or feel it, the air around us is pushes against every surface. But by following the instructions for this science experiment you can watch as the plastic bottle is crushed by the air around it. Step 1 – Begin by filling your 8×11 pan with ice. Step 2 – Next, pour 1/2 cup of Boiling Water into the 2 liter bottle. After the water is in the bottle, wait for 2 minutes. Step 3 – After two minutes have passes, put the lid back on the bottle. Make sure that it is tight. Step 4 – Lay the bottle on it’s side in the pan full of ice. Step 5 – Slowly pour the pitcher of ice water onto the bottle. Step 6 – Stand the bottle up and observe what happens. The plastic bottle has been crushed in. Once the hot boiling water was placed in the bottle, it heated up the air inside the bottle. When we put the cap on the bottle, the hot air was trapped inside. When we then placed the bottle in the ice and poured the cold water on it, the air inside the bottle began to cool down. Cool air exerts less pressure than hot air, therefore the air pressure inside the bottle because to decrease. The air pressure inside that bottle bottle decreased to the point where it was less than the air pressure outside the bottle. Therefore the pushing in was greater than the pressure pushing out, causing the bottle to be crushed. If you are looking for more experiments dealing with Air Pressure then you’re in luck. 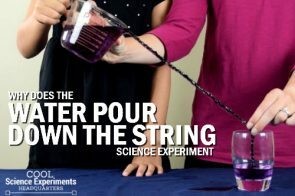 Check out these other fun and simple experiments we’ve done. Or turn a Water Glass upside down without spilling the water! And you can even make a balloon fly across the room like a rocket. I hope you enjoyed the experiment. Here’s some printable instructions! Begin by filling your 8×11 pan with ice. Next, pour 1/2 cup of Boiling Water into the 2 liter bottle. After the water is in the bottle, wait for 2 minutes. After two minutes have passes, put the lid back on the bottle. Make sure that it is tight. Lay the bottle on it’s side in the pan full of ice. Slowly pour the pitcher of ice water onto the bottle. Stand the bottle up and observe what happens. The plastic bottle has been crushed in.